We attended a lecture (we had to leave early, so missed the "public forum" part) the other night by Professor Richard Smith, Rutgers University lecturer, economic historian, member of the System Change Not Climate Change network in the U.S. and author of articles like "Green Capitalism: The God That Failed" and "Capitalism and the Destruction of Life on Earth: Six Theses on Saving the Humans." 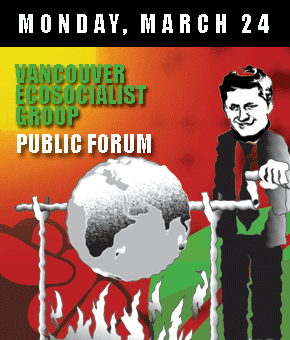 Professor Smith's visit was sponsored by the Social Environmental Alliance and the Vancouver Eco-Socialist Group, organizations that see capitalism as a root cause of the climate change crisis and who are calling for "system change" as the crisis deepens. "Ecosocialists see this ecological crisis as a symptom of the underlying economic and social system called capitalism, whose basic operating features include: (1) the imperative of profit and competition-driven expansion without limit, (2) the treatment of human labour and the natural world as commodities for sale rather than having value for human well-being and ecological stability; (3) benefits to a small and privileged social class wielding inordinate political power, (4) deformed social priorities amongst humans, including in our relationship to the rest of nature." The title of Smith's talk was No to Climate Change - Yes to System Change. It was interesting and in many ways, spot on. He sure understands the climate change emergency. He is calling for a revolution away from capitalism -- or at least the worst forms of our Western, industrial, globalized, capitalist economy (the pillaging sort of capitalism that doesn't give a damn about the consequences of habitat destruction, resource loss, pollution or climate change). The problem is, we don't have time for an economic revolution. We need to get going on what we can be doing now. And that's simple. Economists keep telling us that the market can solve our ills. The time has come for them to prove it. Let's see what that "invisible hand" does with the market once we've set the following in place. My guess is that investments will swing briskly toward renewables! 2. Tax carbon. Really tax carbon. 3. Charge for pollution. Let companies pay for the social (health) and environmental costs of their businesses, damn it. Seriously, why should taxpayers have to cough up when corporations should be paying these costs before calculating their profits and paying dividends to shareholders? 4. And what of the banks? Don't they have just a teeny weeny bit too much power ("credit capitalism")? With none of the responsibilities? ** Some people worry that removing all fossil fuel subsidies will be unjust for poorer people. In the short term, this could well be true. But long term, fossil fuels are going to kill all of us, whether we're rich or poor. However -- and I welcome your thoughts on this, as mine aren't fully formed yet -- I think that winning an international race to zero carbon will actually be easier for the least developed nations, as they have come late to the fossil fuel party. Climate justice is for future generations as much as for today's less fortunate.